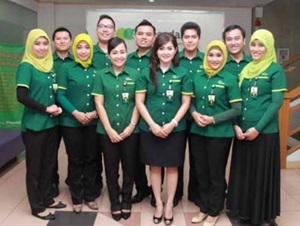 PT Pegadaian (Persero) - Pegadaian is a long standing state-owned financial services company in Indonesia. Established since 1746, Pegadaian has core business focus on pawning loan services. The history of Pegadaian goes back to 1746 when Vereenigde Oostindische Compagnie (VOC or The United East India Company) established Van Leening Bank as a financial institution that provides credit with a pawn system. Established the first state-owned Pegadaian in Sukabumi West Java on 1 April 1901. After several times changes of its status, the name of PT Pegadaian (Persero) officially launched in 2012. Headquartered in Jakarta, Pegadaian has a monopoly on fiduciary service in Indonesia and has its business activities focused in 3 sectors: financing, gold and various services. As of December 2016, Pegadaian conducted business operations in all parts of Indonesia under the management of 12 regional offices, 59 area offices, 629 branch offices, 3.826 branch unit offices spread in all over Indonesia. Pegadaian also supported by nearly 12,943 employees. Pegadaian supported by 3 subsidiary companies and 1 associated company; PT Balai Lelang Artha Gasia (99.99%), PT Pesonna Optima Jasa (99.00%), PT Pesonna Indonesia Jaya (99.00%), and PT Pefindo Biro Kredit (23.37%). In the business year of 2016, Pegadaian has recorded a positive financial growth and satisfactory performance. According to information found in PT Pegadaian (Persero) Annual Report 2016 as cited by JobsCDC.com, Pegadaian managed to record total asset of Rp 46,873.89 billion in 2016. This reflected an 19.7% increase year-on-year (YOY). Pegadaian's total assets in 2015 amounted to Rp 39,157.96 billion. Pegadaian managed to record a 8.67% growth in total operating revenue in 2016 value of Rp 9,708.06 billion as compared with Rp 8,933.34 billion in 2015. Total net income for current year 2016 went up by 14.02% YOY from Rp 1,938.43 billion in 2015 to Rp 2,210.25 billion in 2016,. Minimum S1 in any field with a minimum GPA of 3.00. Have experience in Marketing or Sales for at least 2 years. Able to operate computer properly. Able to communicate in active English. Have own vehicle and SIM. Candidates who meet the qualifications will be placed in all regional office Pegadaian throughout Indonesia. For placement Denpasar and Eastern Indonesia areas : Preferably local resident and living in same city as work location. JobsCDC.com now available on android device. Download now on Google Play here. Please be aware of recruitment fraud. The entire stage of this selection process is free of charge. PT Pegadaian (Persero) - Marketing Executive Pegadaian April 2019 will never ask for fees or upfront payments for any purposes during the recruitment process such as transportation and accommodation.